xTumble Bot last updated on 04-21-19 and now supports auto posting to tumblr from pinterest! 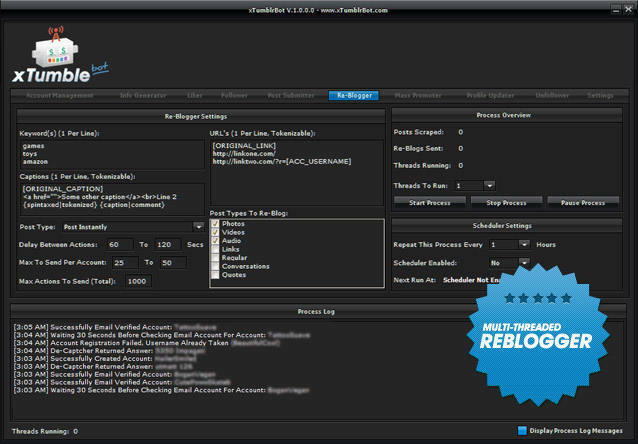 Multithreaded, multi-account, multi-function tumblr bot package that will drive home some serious traffic from tumblr. xTumble bot is by far the most comprehensive, and fastest Tumblr automation suite on the market, don't waste your time and money on other under performing "toy" bots. Xtumble bot is the only tool you need to pull a full time income and make some serious money from tumblr. Massive Amounts of Traffic, Easily Attainable. Just take a look at what one of our tumblr bot beta testers was able to achieve in just a week with the bot running brand new accounts at an EXTREMELY moderate pace. This is really only skimming the surface of what the toolset is capable of, at 5-10 instances of our tumblr bot at a time with 100 threads combined with xTumbles viral script, 50,000 visitors a day is not out of the question. Everything you need to command an army of legit tumblr blogs. Scale your empire and Simultaneously manage thousands of tumblr blogs at once. manage thousands of accounts simultaneously. 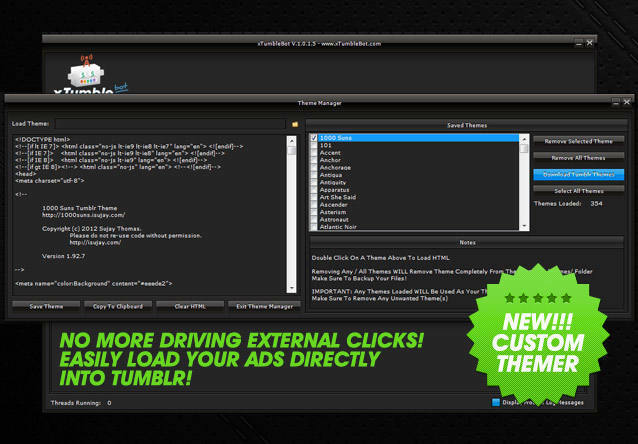 Automatically create accounts with our built in browser automation control ready for use with the latest Tumblr updates. Note this feature is no longer multi-threaded. Supports 2captcha & ImageTyperz automatic captcha solving services. Easily sort through and filter through good and bad accounts. Check accounts by logging in. Check accounts by profile page. Keep track of a wide range of actions each account is making, and export to csv format for offline viewing. Send Likes to other users blogs and reblogs based on a number of keywords of your choice. Keyword based liker delivers targeted likes. Schedule task to run daily on auto-pilot. Follow targeted users by keyword. 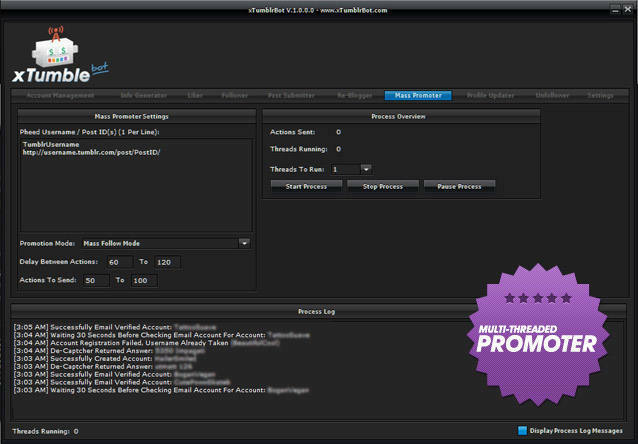 Keyword based follower delivers targeted followers. Post across your network of accounts with ease with multiple post types supported. Advanced watermarker feature included in elite and enterprise versions. Post instantly or add to que for later. Easilly find and reblog niche content at blazing fast multi-threaded speeds. Skyrocket your accounts, and blogs to the top of tumblrs feeds by making them appear extremely popular. Mass follow a list of specified accounts. Mass reblog a specified post. Update your tumblr blogs profiles, descriptions, and even custom theme with the click of a button. Update profile images, descriptions, titles, and more. Update que settings to optimal tumblr posting times. NEW!CUSTOM THEMER! Upload your own custom themes and insert your ads, analytics, or any other code directly into your network of tumblr accounts. Unfollow users that don't follow you back quickly and efficently. Unfollow only those that don't follow you back. Control every aspect of xtumble bot from the easy to use interface. The most comprehensive Tumblr bot on the market. Choose Your Weapon, And Prepare To Dominate. Take control of your traffic and invest in the #1 automation toolset of 2019 Today. 1 PC License - Manage 1500 accounts. 2 PC License - Manage 5,000 accounts. 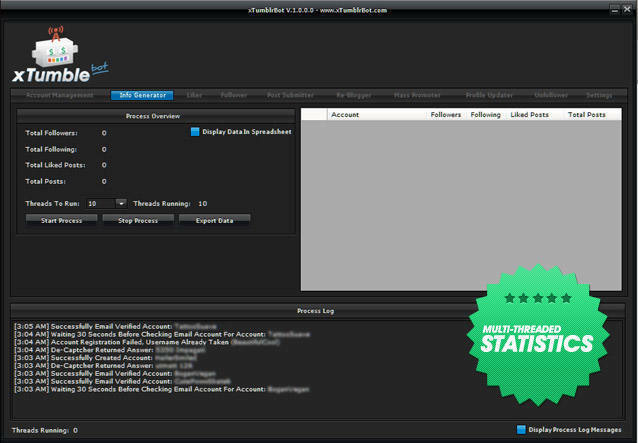 1 month free membership to an exclusive private botting network. 3 months free membership to an exclusive private botting network. Copyright © by xtumblebot.com All rights reserved. We are in no way associated with Tumblr or Tumblr.com. Software is for educational purposes only.